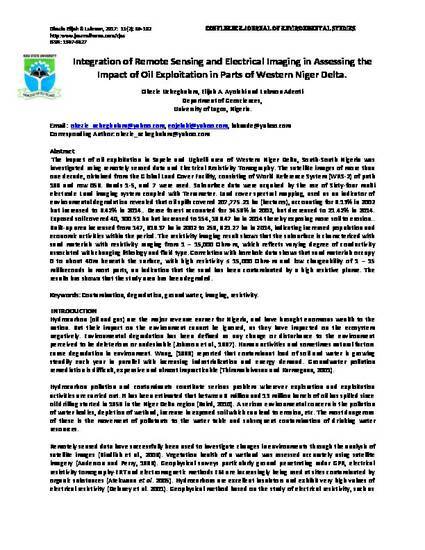 The impact of oil exploitation in Sapele and Ughelli area of Western Niger Delta, South-South Nigeria was investigated using remotely sensed data and Electrical Resistivity Tomography. The satellite images of more than one decade, obtained from the Global Land Cover Facility, consisting of World Reference System (WRS-2) of path 189 and row 056. Bands 1-5, and 7 were used. Subsurface data were acquired by the use of Sixty-four multi electrode Lund imaging system coupled with Terrameter. Land cover spectral mapping, used as an indicator of environmental degradation revealed that oil spills covered 207,775.21 ha (hectares), accounting for 6.13% in 2002 but increased to 6.42% in 2014.. Dense forest accounted for 34.59%.in 2002, but decreased to 21.42% in 2014. Exposed soil covered 40, 300.51 ha but increased to 154, 186.47 ha in 2014 thereby exposing more soil to erosion.. Built-up area increased from 147, 616.37 ha in 2002 to 258, 921.27 ha in 2014, indicating increased population and economic activities within the period. The resistivity imaging result shows that the subsurface is characterized with sand materials with resistivity ranging from 1 – 15,000 Ohm-m, which reflects varying degree of conductivity associated with changing lithology and fluid type. Correlation with borehole data shows that sand materials occupy 0 to about 40m beneath the surface, with high resistivity ≤ 15,000 Ohm-m and low chargeability of 1 – 15 milliseconds in most parts, an indication that the sand has been contaminated by a high resistive plume. The results has shown that the study area has been degraded.